Universal Pictures has risen through the viral chart to second place this week, while Jean-Claude van Damme's "epic split" for Volvo Trucks remains on top with 429,729 share. 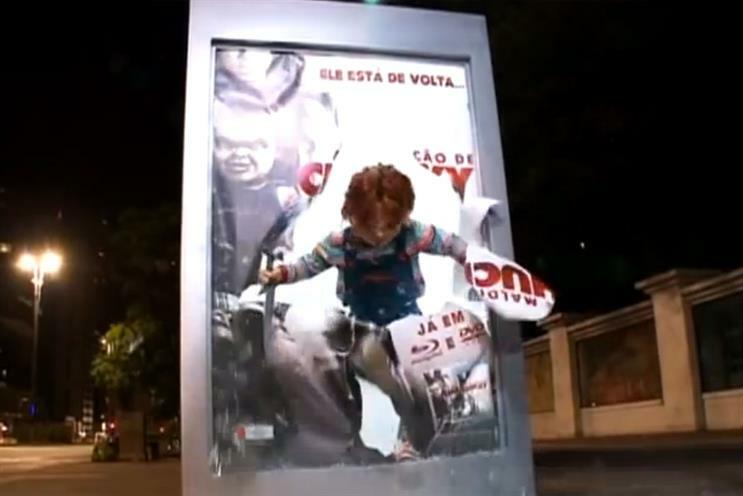 The ad for Universal Pictures, created in-house, shows the horror movie character 'Chucky' crashing through the glass of a bus stop while unsuspecting members of the public are waiting for a bus. The video has been shared 371,244 times this week. The Volvo Trucks viral, starring van Damme, continues on top of the viral chart this week. The ad, shared 429,729 times over the past seven days, features van Damme performing the splits while straddling two moving trucks. It has been shared 2.6 million times in total and was created by the agency Forsman & Bodenfors. Elsewhere, Kmart's Christmas ad featuring a chorus of men playing jingle bells in their boxer shorts has taken third position. Created by Draftfcb, the ad has been shared 354,290 times this week. John Lewis, who had the only Christmas ad in the chart two weeks ago, ranks seventh this week with 91,447 shares for its "the bear and the hare" spot, created by Adam & Eve/DDB. For the second week in a row, the John Lewis and Kmart Christmas offerings are joined by a Christmas ad for the NBA, which is in tenth position, down from fifth last week.